Chances are that you are using MailChimp as your email service provider. It’s popular, and so I could almost guess. 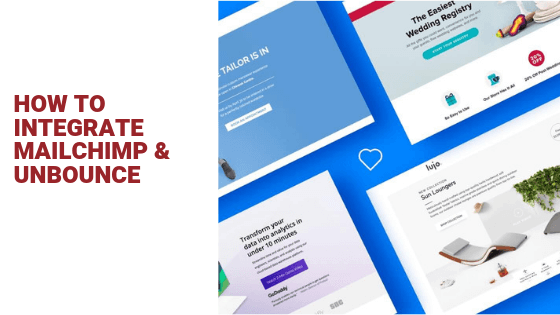 Integrating your Unbounce Landing Page(s) with MailChimp is one of the first things you should do to ensure that you collect all your leads in not only within Unbounce but also as a “list” within your MailChimp account. As soon as leads sign up on your Unbounce Landing Pages (or Unbounce Pop-ups or Sticky bars), those lead details are automatically pushed into the specific lists that you’d specify. Unbounce natively integrates with MailChimp. Plus, it integrates with a few other Email Service Providers, marketing automation platforms, and also Zapier (which in turn helps you connect Unbounce with several other popular email service providers such as Drip, marketing apps, CRM systems, and more). Be sure to have admin level access to your MailChimp account as you go about integrating your Unbounce landing pages with MailChimp. Trigger autoresponders (Using MailChimp automation) to deliver lead magnets, coupons, or whatever it was that you promise on your Unbounce landing pages or coupons). If you aren’t sending out autoresponders, welcome messages, or customer welcome sequences (and I wonder why you aren’t doing that yet? ), you’ll at least have a list of people who’ve signed up on your Unbounce landing pages or pop-ups. Use these lists (as CSV files downloaded from Unbounce or as MailChimp lists) to create Facebook audiences (by uploading these lists as custom audiences within Facebook). This is will be a crucial Facebook audience which you can include or exclude while launching Facebook ads (similarly applicable for Google Ads).